On the Vineyard, builders and design/build teams are working to perfect efficient and attractive small house designs. Much of their work comes in response to homeowners looking for a secondary dwelling that can house aging parents or newly married children with young families, or that can function as an affordable rental for a year-round Islander. 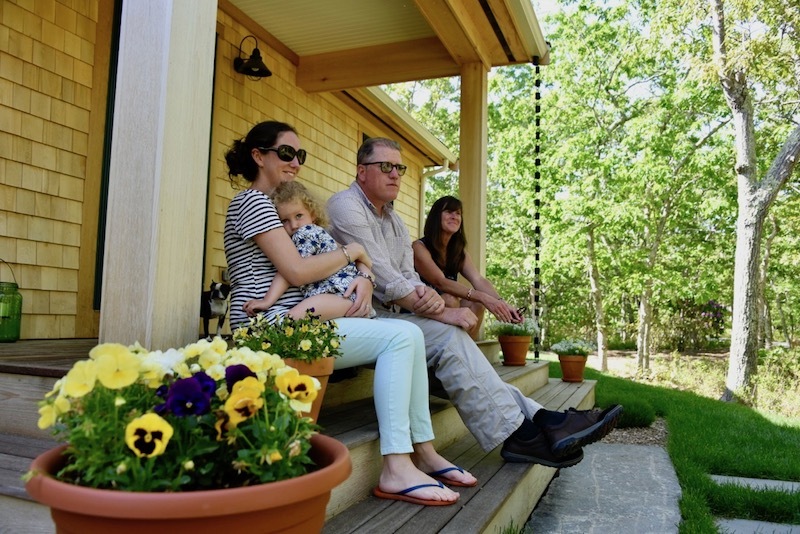 With changes in zoning regulations in West Tisbury and Chilmark in recent years, detached, secondary dwellings built specifically to house family members or caregivers, or to function as affordable year-round rentals, are permissible if they meet town criteria and gain the required permits. We took a look at three new houses that show how livable 800 square feet can be, thanks to some imagination, good design work, and quality materials. 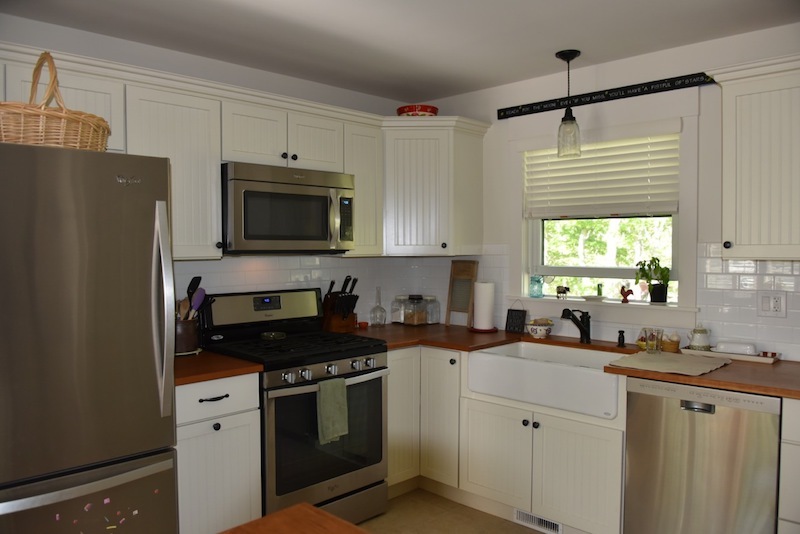 At costs ranging from around $270,000 to $320,000, these small houses are certainly not inexpensive, but for landowners who are willing and able to utilize their property to increase the stock of year-round housing, they offer real potential. Turns out Dan Rossi was admiring the house his next door neighbors were building, and wanted to ask Gongola more about Squash Meadow. At first Ryan was skeptical. “He said, Mom, isn’t that going to be like ‘Everyone Loves Raymond?” Jane remembers. They backed off the idea for a while until Ryan and Ellen came back to them and brought the idea up again. By the time Chief Rossi met Matt Gongola, he had a design for a small house in mind and had talked to a friend about building it. But the timeline was uncertain and the Rossis wanted to get started. Gongola wasn’t sure Squash Meadow would actually have a window in their busy schedule either, but he steered the Rossis to Bill Potter, head of Squash Meadow Construction. 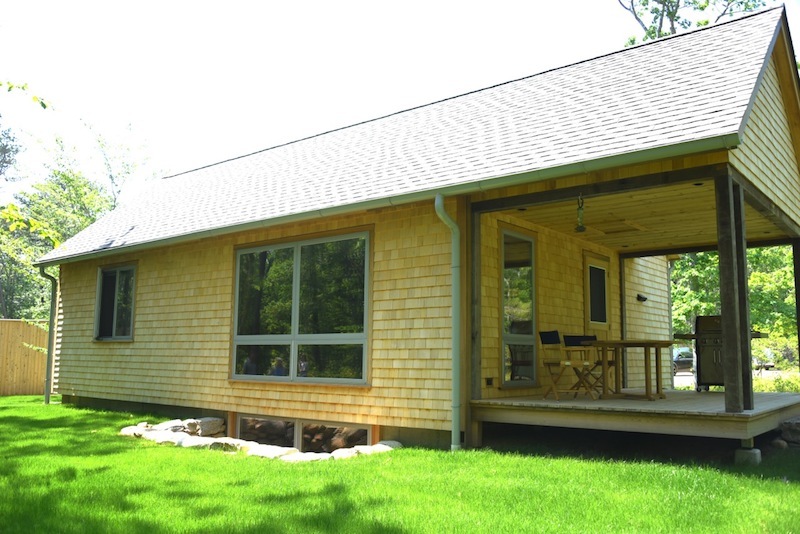 Squash Meadow is a full-service design-build company in Vineyard Haven that does both traditional stick-built (framed) construction as well as modular construction, partnering with Westchester Modular Homes of New York. “I had never seen what could be done with upgraded modular construction, and I was impressed,” Dan Rossi said after an initial visit to the office. “We sat down with Dan and Jane in July,” Bill said. “We set the house on September 21, and they were in December 2,” Matt added. 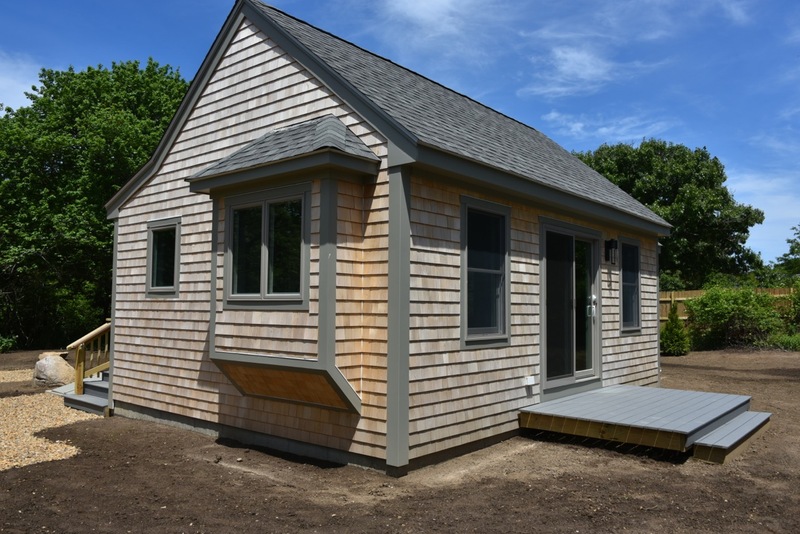 Because of the smaller size of this house (it arrived in two parts on a barge from New Bedford), the usual estimate of a three-month building time for modular construction turned out to be even shorter. 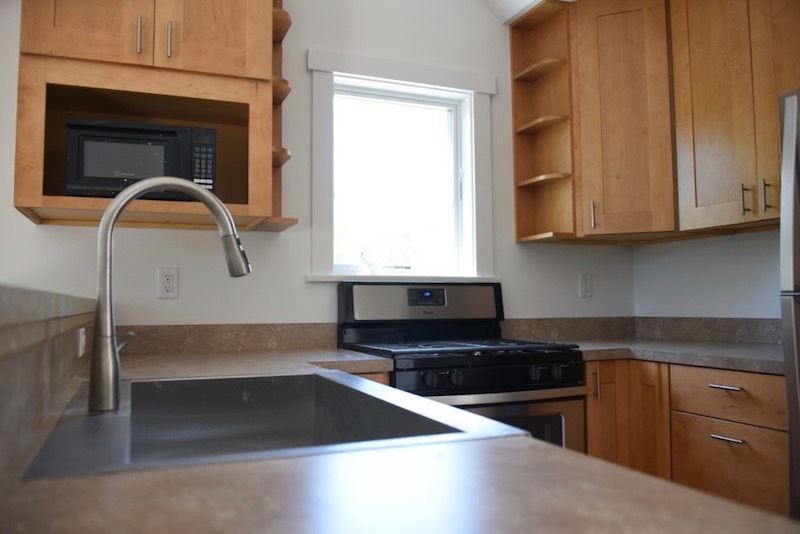 The 800-square-foot, one-bedroom house came with the kitchen cabinets installed, but counters were finished on-site. Two porches, as well as an outdoor shower and housing to cover the basement entrance were also built onsite. Squash Meadow finished the exterior of the little house in a manner complementary to the main house. Dan and Jane Rossi, who met in Menemsha when they were 16 years old, couldn’t be happier with their new home. 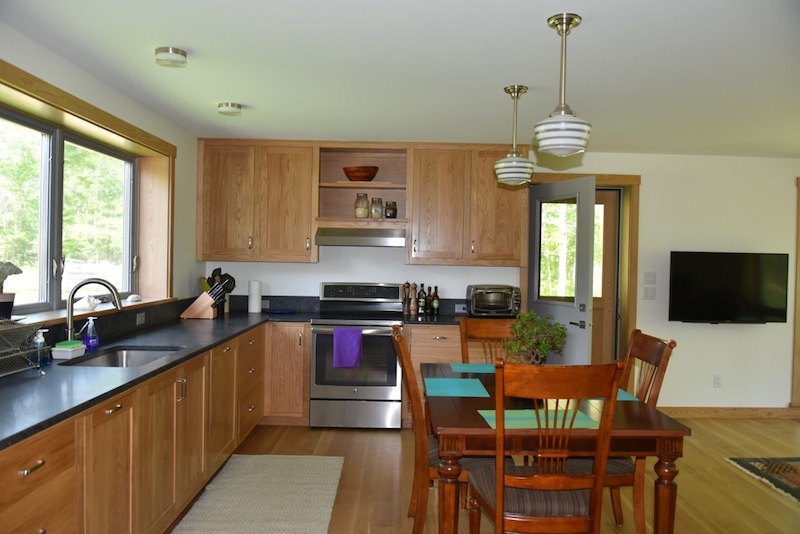 It’s light and airy and has a very spacious kitchen with beautiful cherry countertops. In addition to a full bath (and two nice-sized closets) off the bedroom, there is a half-bath (and stacked laundry) off the entryway, too. And they spend a lot of time on that screened porch. 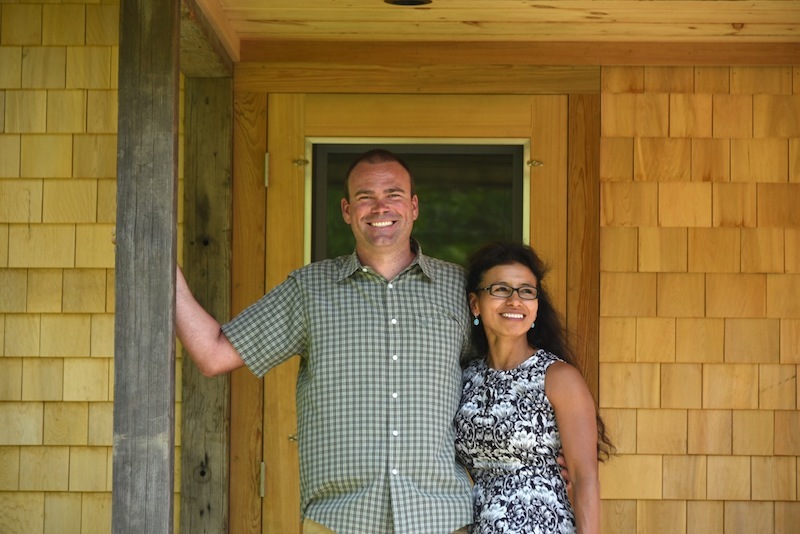 Wife and husband design/build team Joan and Phil Hughes of Hughes Construction in Oak Bluffs have, to date, completed three 800-square-foot projects in Chilmark for three very different clients. The first one was strictly a guesthouse for a homeowner’s grown son and his family, and it has gracefully housed four tall people (including two growing children) for many summers now. The second house was a fancier version of the first (but still 800 square feet), built for two doctors who spend 6 to 8 months of the year on the Vineyard. But the third—the one the Hughes just finished in July—will be year-round housing for a young family of three and is the happy result of a confluence of circumstances. 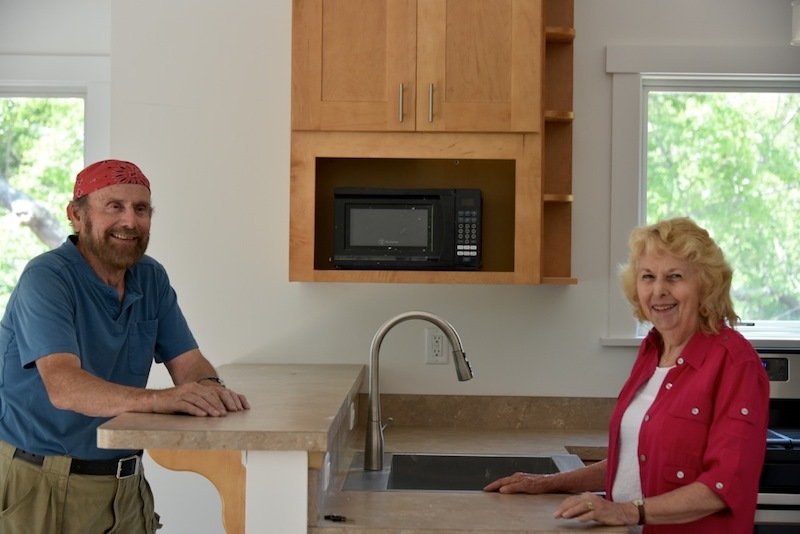 Chilmark homeowners Jim and Joan Malkin happened to see the first of the Hughes’ 800-square-footers around the time they were considering constructing a small house on their own property, specifically with the goal of making it an affordable year-round rental for an Islander. Having watched young people struggle with housing on the Island, they felt their 3-acre property could accommodate something like this, and they were willing to build it with the idea of renting it at a rate commensurate with federal guidelines for affordable housing, and to find an income-qualified tenant through Dukes County Regional Housing Authority. 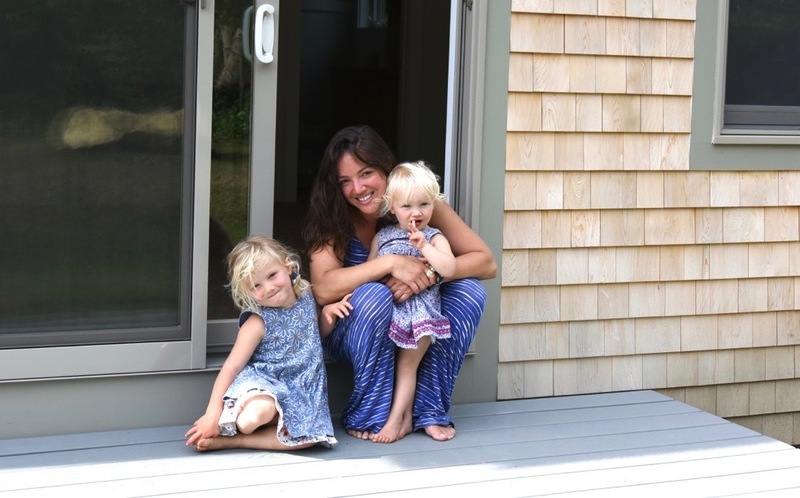 Simultaneously, Ariana Binney and her two small children, Zelda, 4, and Audrey, 2, were living with Ariana’s parents, having done the Island shuffle nine times in four years. Ariana and her sister Kayla Allen-Posin run At Home in The Woods, a nature-based home-school cooperative in West Tisbury modeled on the Forest School. Despairing of ever finding an affordable year-round home for her young family, Ariana completed the paperwork to qualify for affordable housing through DCRHA and found herself on a short list for the Malkins' rental house. The housing authority noted that she had moved frequently and therefore wanted solid references. 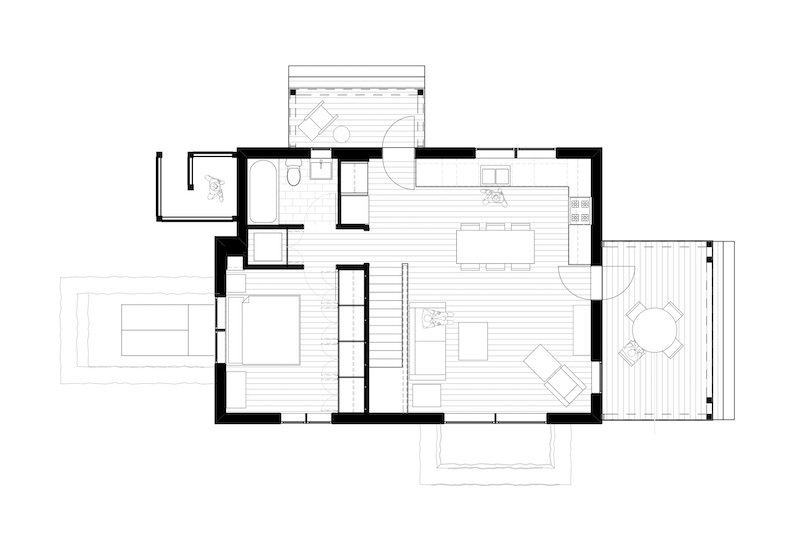 Joan Hughes is very pleased with the little details she was able to introduce in this design to make the minimalist two-bedroom house feel lighter and live larger. Pocket doors save space, and Joan tucked the laundry into the bathroom, rather than putting it in the basement, which is accessed from the outside. She raised the ceilings (also driving Phil crazy!) to make the living area feel especially roomy. One last decision—the vinyl flooring that looks like wood—really suits the handsome little house. The house is so handsome, in fact, that Phil says, “All the trades want one.” Apparently every subcontractor who worked on the house asked Phil if he could build one for them. “You don’t know how many people tell us they want one of these!” Joan says. In 2009, a lovely woman named Madeline Blakely died on the Vineyard. Not long after, John Abrams, president of South Mountain Company, got a copy of Blakely’s will in the mail with a letter stating that she had left two modest sums (almost her entire savings) to South Mountain, who had built her a beloved little earth berm passive-solar house many years before. Her will stipulated that she wanted the money used to further affordable housing solutions and to do something for renewable energy. Architect Matt Coffey took on the design project, and the M-Line plans, named for Madeline, were born. “When we started this, we didn’t necessarily know how far it was going to go,” Coffey said. 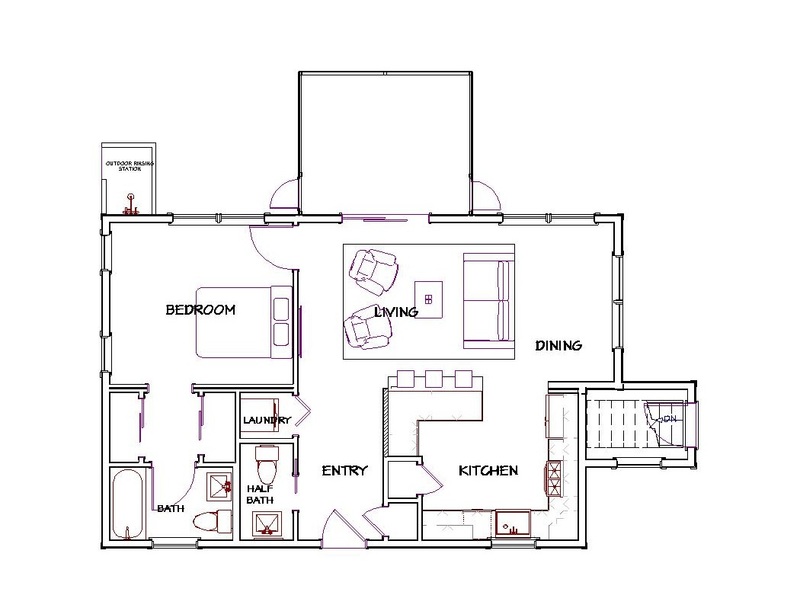 “We thought we’d shoot for a one-bedroom version, a two-bedroom version, and maybe a three-bedroom option. But now we have 5 prototypes, and have completed 6 houses using these plans. 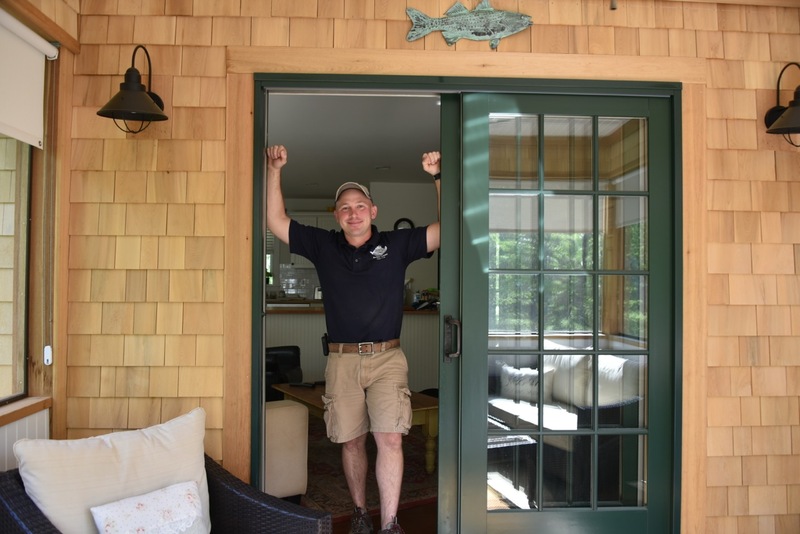 The latest—and the smallest at 800 square feet—belongs to electrician Jarret Brissette, who asked South Mountain to build him both a new shop and a small house on his West Tisbury property. Brissette and his girlfriend Nancy Villarreal liked the idea of living in a small house since it is just the two of them, and Brissette felt it might be smart to build an 800 square-footer in case he ever wanted to build a bigger house or subdivide his property. The smaller house could then potentially become a rental for another Islander. Through his business, Brissette had worked on projects with South Mountain and was impressed by their quality and aesthetic. Brissette loves all the energy-efficient features, too. 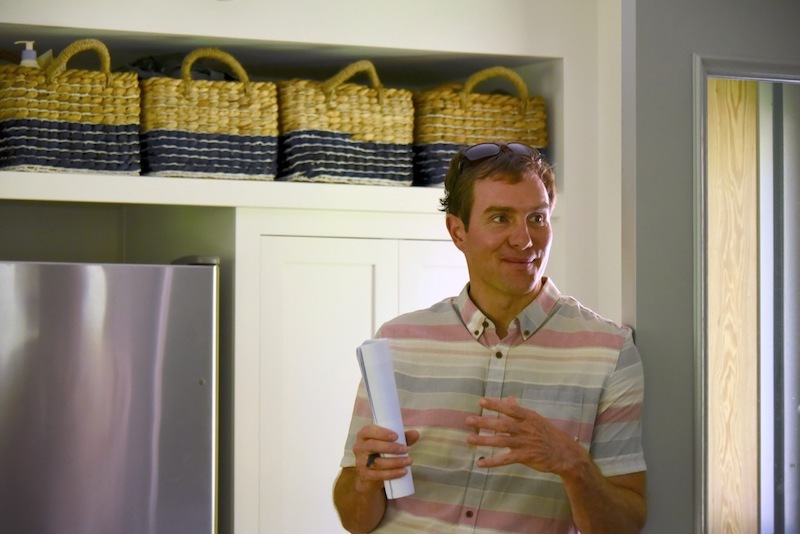 “Our goal with this house was net zero design, so everything in the house is powered by electricity—no fossil fuels,” Coffey explained. Net zero design basically means that the solar electric system generates enough power to completely offset the home’s total utility usage. 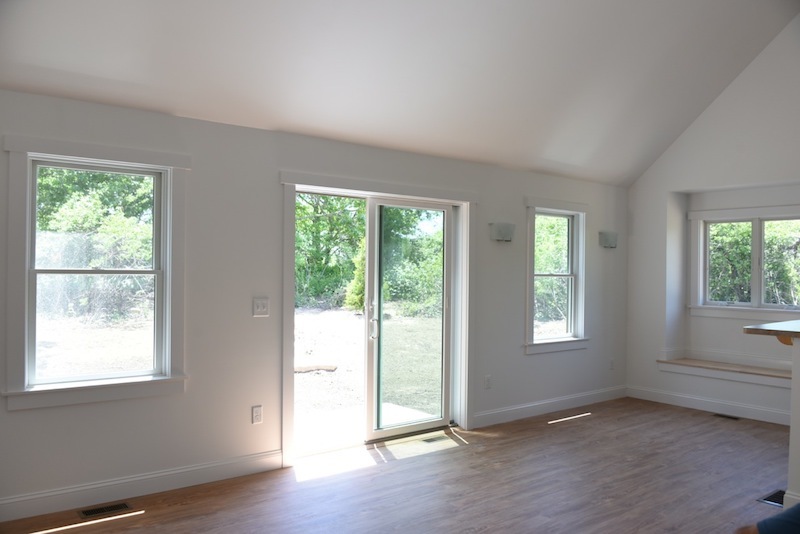 South Mountain also specified triple-glazed windows and an extra layer of rigid foam insulation in addition to the insulation in the 2x6 framing. There is a fresh air recovery system that keeps fresh air constantly circulating through the house. And the house is designed to “age” well along with the owners, with doors wide enough for wheelchair access and other age-friendly features. Brissette requested just a few changes to the basic M-Line plan—namely a deeper entry porch (for a few chairs) and a larger covered deck (for grilling and entertaining) on the side of the house. 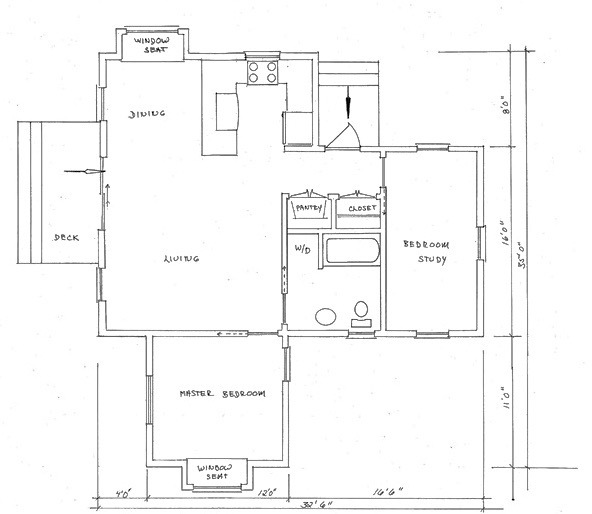 He also opted for an L-shaped kitchen that would open up a bit more space for the living/dining area. Brissette’s house has a large basement accessed from inside the house. Thanks to a large window, it is a light-filled space and great for storing gear. But without a second egress option, it is not considered living space, and therefore not part of the overall square footage of the house. Of all the wonderful features in his house, Brissette says that the outdoor shower just may be his favorite. Not surprisingly, all three of the 800-square-footers have outdoor showers, which provide extra washing area for a small house. And well, you just have to have one on the Vineyard. It’s clear that while 800-square-foot secondary dwellings can help families transition through life changes, they can also offer another benefit that’s appealing to many—a simpler lifestyle, less to care for, and a home with potentially less impact on the environment.